You're IT Mad Hatter Chorus! Three questions with Robert Serrano Mad Hatter Chorus. Tell me about Mad Hatter Chorus. 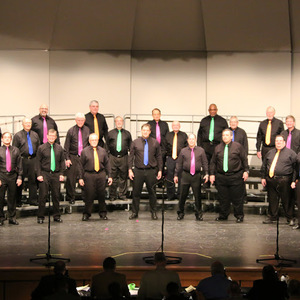 The Mad Hatter Chorus is a men's a capella vocal group started 53 years ago in 1966. We are a chapter of the Barbershop Harmony Society, a worldwide organization promoting the singing of barbershop style music. Men of all ages are welcome to join our chapter. If you can sing your part on one of the songs we do with a group including the three other parts, you qualify to be a member. Our mission is beautiful singing while spreading joy and harmony. I wish I could have everyone experience the fun and excitement we feel when we sing. We perform for groups throughout the Danbury/Bethel area at nursing homes, schools, parties, libraries, etc. We also offer Singing Valentines every February. For more information please visit us at our website: madhatterchorus.org. The Mad Hatter Chorus tags Molten Java!